Photo Credit : Photography by Anna Kucera and Aer Design. 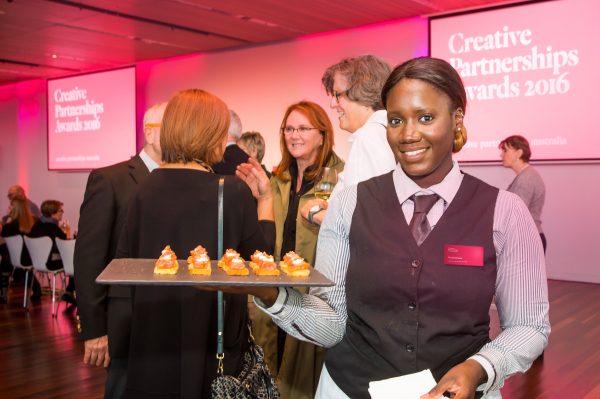 The Creative Partnerships Awards celebrates the dedication, passion and leadership of five inspiring Australians who are leading the way in bringing arts, philanthropy and business together to create great art and culture. 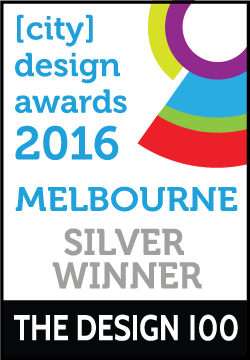 Aer Design was approached to design the events' visual identity, including the trophies, print, digital collateral and event space. 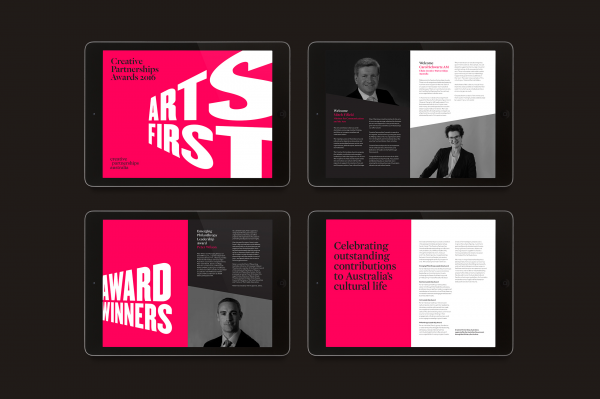 As the event celebrates and honours those who bring art to the forefront, Aer Design's response visually represented creativity overtaking the space and making "ARTS FIRST”. 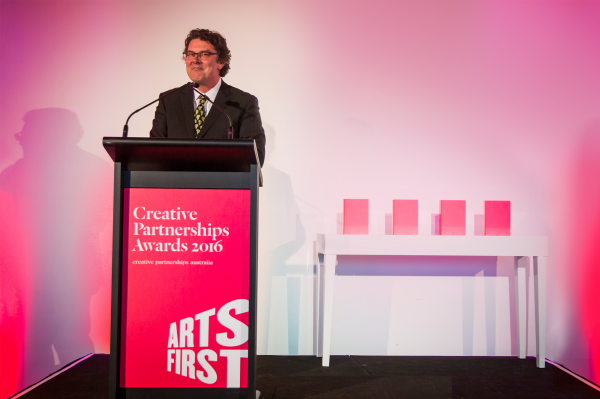 Creative Partnerships Australia were honouring five Australian’s who are leading the way in bringing arts, philanthropy and business together to create great art and culture. 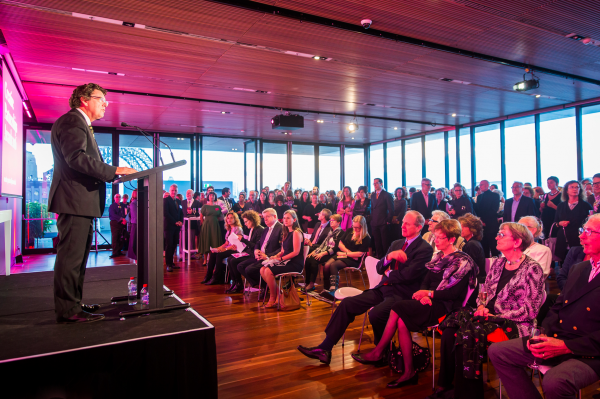 The event needed to reflect the dedication and passion of the award winners showcasing their contribution to the arts community. As the award's night was the first in this format, it had to make an impact on a visually verse audience with a jam packed art calendar. 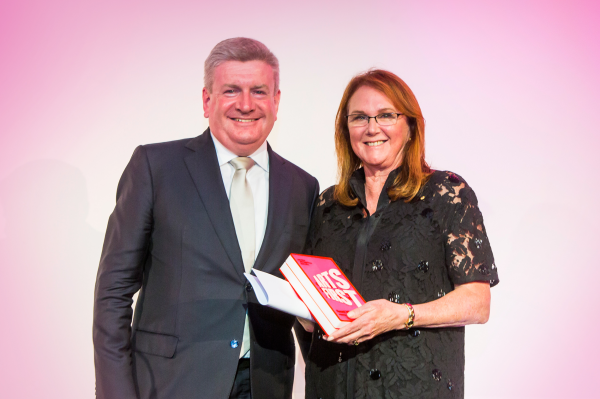 It needed to inspire others to make a difference to Australia's art and culture… and create a coveted award! Celebrating and honouring those who bring art to the forefront, Aer Design's response visually represented creativity overtaking the event and putting "ARTS FIRST” over every piece of collateral and experience for the guests. The event was designed to engage, surprise and delight. The venue was drenched in neon pink lighting, with bold typography projected across the room. Aptly held at Sydney’s Museum of Contemporary Art, a hub of the Australian art world with views of the Opera House and Harbour Bridge. 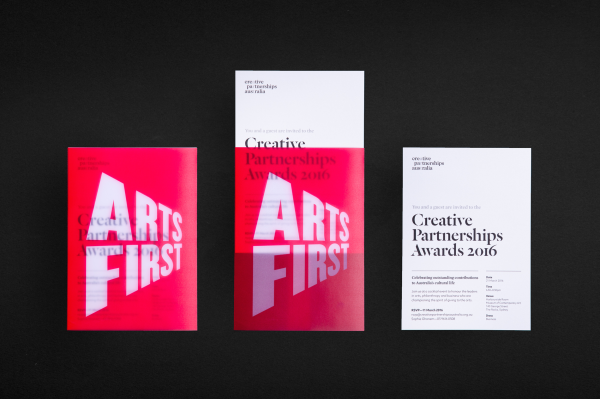 Every piece of collateral and experience for the guests was enveloped by the message, "ARTS FIRST”. Neon pink was used to aid the impact of the message. 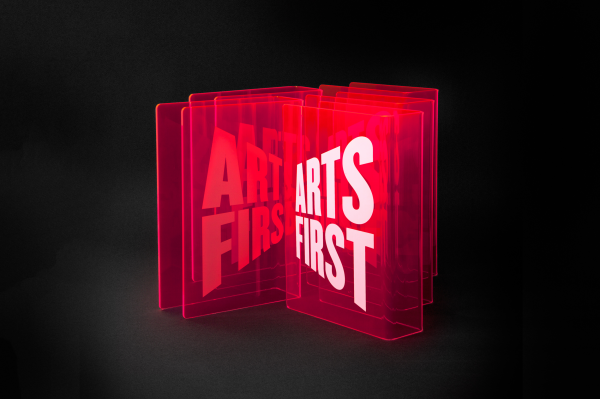 Guests, around 300, were sent personalised invitations that were interactive, allowing the invitee to remove the neon pink sleeve to reveal the event information below the message “ARTS FIRST". A sense of excitement leading up the event was created through digital marketing featuring animations of key messaging. "ARTS FIRST" was animated to shift perspective, representing the different ways people perceive art. 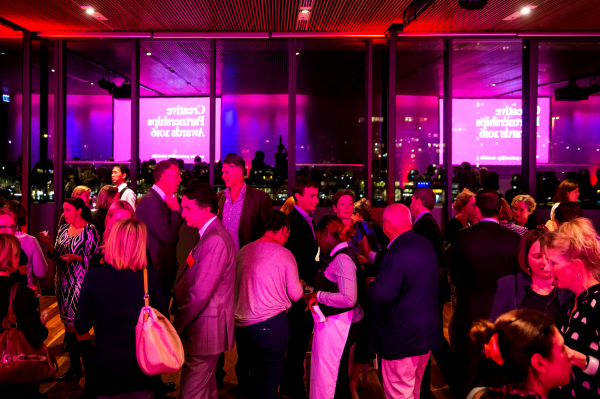 The evening commenced with guests being welcomed into a flood of neon pink, surrounded by pink lighting, projections, signage, name-tags…even neon pink drinks! Animations of “ARTS FIRST” filled the screens through the space and films of the winners inspiring work were produced and played at intervals. 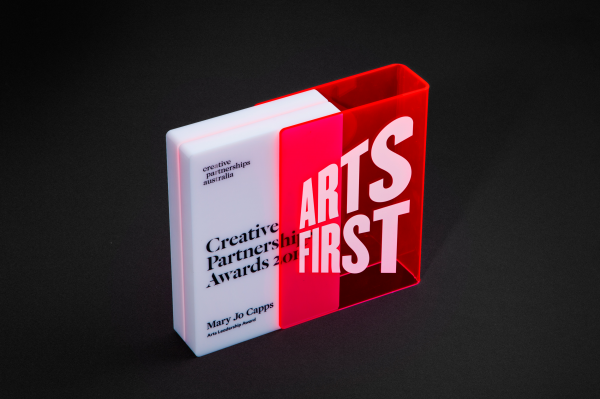 The trophy design, a solid 3D acrylic form, was produced using modern printing and construction techniques. It was presented in a neon pink sleeve that was removed to reveal the winner underneath. Guests were delivered a digital program of the night, along with a gallery of photography as a keepsake and reminder of the Creative Partnerships Awards winners. The design process of Aer Design is underpinned by the values of sustainability. We constantly address our approach internally and with external suppliers. For this project we partnered with local producers for printing and trophy manufacturing. Paper used was FSC Certified. The program was presented digitally, negating the need for another print run. The design of the event space focused on using digital and lighting solutions, reducing the need for production of one-off use signage.